Looking to show off your fantasy basketball genius this week? Try DraftStreet, where you can put together a new fantasy team each week and compete against other users for real money. 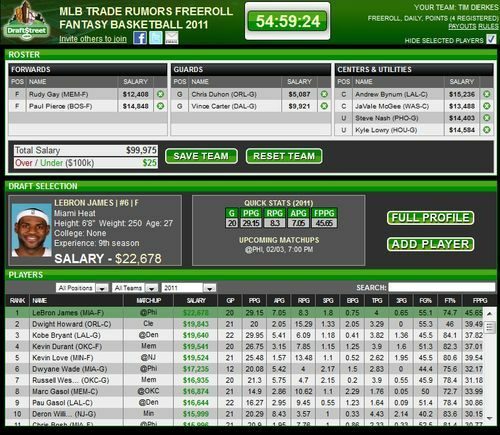 Right now DraftStreet has an NBA freeroll for MLB Trade Rumors readers, meaning you can take a shot at a chunk of the $400 prize pool for free, with no strings attached. Here's how it works. If you're interested, sign up and create a roster prior to Friday's games (7:00pm eastern time). It's quick, easy, fun, and the MLBTR league gives you a free chance to win some of the $400 prize pool. If you enjoy the competition you can try other leagues for free and earn credits, or deposit real money. Huh? why is this an MLB rumor? Haven’t been here long, have you? I thought NBA Trade Rumors was going to start today. What is the latest on that? You are tearing me apart Timmy!